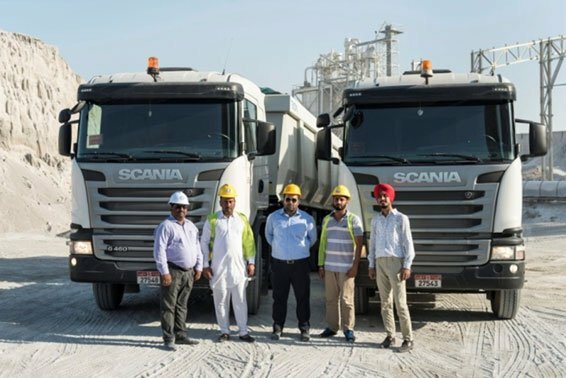 The constant progression and unceasing infrastructure projects in the country obtain a favorable opportunity for Super Cement Manufacturing Company to acquire additional 10 units Scania trucks in expanding their fleet lineup delivered last December 2016. The additional fleet consists of 4 Tractor head 6×4 with cement bulker, 2 Tractor head 4×2 with cement bulker and 4 Tractor head 6×4 with tipper trailer. Super Cement Manufacturing Company LLC, is a granulated blast furnace slag grinding unit, located in Musaffah Industrial Area, Emirates of Abu Dhabi. Their production capacity reaches up to 700,000 metric ton of slag per annum. “As of now, there are several ongoing construction projects that we must prioritize and our vehicles should be readily available to deliver the demand of our customers. I trust our fleet will manage to perform since we have not sent our vehicles for any major repairs until now. We make sure to maintain its condition on regular basis at Bin Brook Motors & Equipment facility, where they handle all minor issues at ease”.